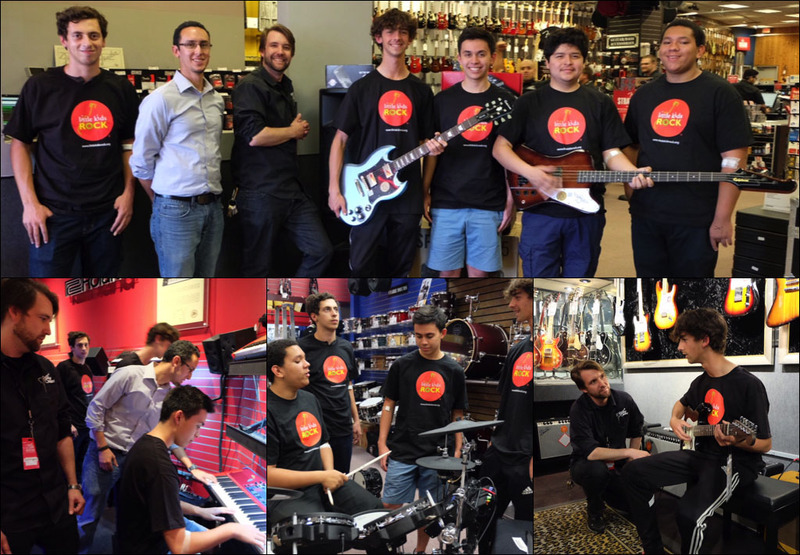 Pictured are Joel Lopez, John Marshall Fundamental Secondary School’s music director (Long–sleeved shirt and glasses); Scott Smith, Guitar Center Pasadena store manager (black shirt); and Little Kids Rock students from John Marshall Fundamental Secondary School (black LKR t-shirts), in Guitar Center’s Pasadena store. Pictured are Joel Lopez, John Marshall Fundamental Secondary School’s music director (Long–sleeved shirt and glasses); Scott Smith, Guitar Center Pasadena store manager (black shirt); and Little Kids Rock students from John Marshall Fundamental Secondary School (black LKR t-shirts), in front of Guitar Center’s Pasadena store. Los Angeles, CA (March 31, 2015) – Guitar Center, the world’s largest musical instrument retailer, recently partnered with Little Kids Rock, a leading nonprofit music education provider to U.S. public schools, to help replace audio equipment and instruments that were stolen from the John Marshall Fundamental Secondary School earlier this month. The replacement instruments and audio gear were presented to the students and the school’s Music Director, Joel Lopez at Guitar Center’s Pasadena store on March 27th. "Marshall High School is thrilled to have the support and donations of Guitar Center in order to support the continued learning and performance of music inside and outside of the classroom,” said John Marshall Fundamental Secondary School’s music director, Joel Lopez. “The music program would not be where it is without the support of such excellent community partners and friends." In 2014, Lopez attended Little Kids Rock’s free music workshop, where he and other teachers from the Los Angeles area were trained and equipped to launch the Little Kids Rock “Modern Band” program, which helps facilitate the teaching of popular musical styles that kids know and love, like rock, hip hop, country, blues and funk. More than 13,000 students in over 170 Los Angeles area schools currently run Modern Band programs, which complement traditional music programs like Choir, Orchestra, Marching Band and Jazz Band. Little Kids Rock and Guitar Center have previously worked together to provide instruments to Miramonte Elementary School in Los Angeles, Calif. and will continue to support music education in additional schools in Los Angeles and nationwide. Photo caption 1: Pictured are Joel Lopez, John Marshall Fundamental Secondary School’s music director (Long–sleeved shirt and glasses); Scott Smith, Guitar Center Pasadena store manager (black shirt); and Little Kids Rock students from John Marshall Fundamental Secondary School (black LKR t-shirts), in Guitar Center’s Pasadena store. Photo caption 2: Pictured are Joel Lopez, John Marshall Fundamental Secondary School’s music director (Long–sleeved shirt and glasses); Scott Smith, Guitar Center Pasadena store manager (black shirt); and Little Kids Rock students from John Marshall Fundamental Secondary School (black LKR t-shirts), in front of Guitar Center’s Pasadena store. Guitar Center is the world’s largest retailer of guitars, amplifiers, drums, keyboards, recording, live sound, DJ, and lighting equipment. With more than 260 stores across the U.S. and one of the top direct sales websites in the industry, Guitar Center has helped people make music for more than 50 years. With an unrivaled in-store experience, an industry-leading online presence and passionate commitment to making gear easy-to-buy, Guitar Center is all about enabling musicians and non-musicians alike to experience the almost indescribable joy that comes from playing an instrument. All we sell is the greatest feeling on earth. For more information about Guitar Center, please visit www.guitarcenter.com.